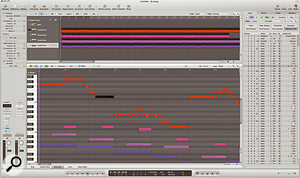 The eighth version of Logic has arguably been the most anticipated music software release of the last couple of years. With a redesigned user interface and some new audio features, can Apple keep existing Logic users happy while broadening the application’s appeal? For the last two years, the anticipation of a new version of Logic has caused quite a frenzy amongst existing users. Any mention of Logic 8 was usually followed by rumours of almost mythical proportions, sightings of the Loch Ness monster, planes returning from the Bermuda Triangle, Paul White declining Hob Nobs... But after much speculation, Apple released Logic Pro 8 on September 12th — nearly three years to the day after the release of Logic Pro 7, and just over five years since their acquisition of Emagic. However, before musicians could even start discussing the new features, Apple instigated three fairly significant and surprising product changes for this new version of Logic. Firstly, it’s no longer possible to purchase Logic Pro as a stand–alone product. In the same way Apple took Final Cut Pro and created the Final Cut Studio bundle, Logic Pro is now part of a new Logic Studio bundle (see box and this month’s Apple Notes for more information). Secondly, the price for the complete Logic Studio bundle is a mere £319$499 — half the cost of Logic Pro 7. And finally, for the first time in Logic’s history, Logic Pro no longer requires a hardware protection device such as the XS Key. All you need to run Logic Pro 8, and the other applications bundled with Logic Studio, is a serial number. Commendably, Apple continue to provide both electronic and printed documentation for their professional applications, and although the box is smaller, Logic Studio’s manuals have the same basic dimensions as those for Logic Pro 7. There’s the usual three–volume set made up of the User Manual, Instruments And Effects and Getting Started guides, along with smaller manuals for the other key Logic Studio applications (Soundtrack Pro 2 and Main Stage), and an installation booklet that contains the new, all–important serial number. In addition to the applications that join Logic Pro to form Logic Studio, the bundle also includes nearly 40GB of content, comprising 18,000 Apple Loops, 2400 Channel Strip Settings and 1300 sampled instruments. This is partly made up of the first five Jam Packs Apple have been introducing and selling since the release of GarageBand in 2004, which include both Apple Loops and EXS24 instruments. The sixth, most recent Vocal Jam Pack isn’t included, but if you consider that Apple sell each Jam Pack for £69$99, you’re really just buying five Jam Packs and getting Logic Pro for free! Because of all this content, Logic Studio is supplied on 10 DVDs: one for the applications, eight for content, and one demo disk featuring songs from recording artists who use Logic Pro. When you install Logic, in addition to typing in your serial number (users upgrading from a previous version of Logic Express will need to enter their original serial number as well, or insert an XS Key) you can choose which of the content you want to copy to your system. This is great since I didn’t really want 40GB of content on my MacBook Pro, whereas I didn’t mind checking it out on my Mac Pro. The installation can take over an hour, depending on how much content you choose to install. The biggest change in Logic Pro 8 is that, for the first time in the application’s 15–year history, the user interface has been radically redesigned. Logic has always attracted a reputation for having a steeper learning curve than other sequencers, although personally, having started with Emagic’s earlier Notator program on the Atari and used Logic since version 1.7, I always found it fairly intuitive. However, the fundamental design of the application didn’t really change that much in the years between versions 1 and 7, and it’s understandable that it became harder for new users to get to grips with. After the release of Logic 7, Emagic had been part of Apple for two years and the transition between the two companies was complete. At this point, given Apple’s emphasis on ease of use and design, it was inevitable that they would want to fundamentally change the application’s user interface. Obviously, Apple wanted to make Logic’s interface consistent with the company’s other professional applications, most notably in the video market; but presumably they also wanted to broaden Logic’s appeal, encouraging more musicians to come to the Mac platform. However, there was a problem. For all its idiosyncrasies, once users became acquainted with Logic, they came to appreciate its power and the speed by which tasks could be accomplished and customised. If you’re going to redesign an application that several hundred thousand people already know how to use, you need to do it in a way that’s as beneficial to those users as it is to the new ones you hope to attract. And that’s exactly what Apple have attempted with Logic 8. The first time you run Logic 8 you’ll be prompted for registration information, and after that the new ‘New’ window appears, offering a collection of templates to use as a starting point in creating a project. There are three collections of pre–defined templates — Explore, Compose and Produce — offering some useful setups, and you can also create an Empty Project and later save it as your own template, which will then show up in a fourth ‘My Templates’ category. Once you create an Empty Project, the new Arrange window will appear with a sheet that forces you to create either a new Audio, Software Instrument or External MIDI track. Software Instrument is the new name for what Logic users previously referred to as an Audio Instrument, and this is the first of many terminology changes that have occurred in Logic 8, which are described in the ‘New Features In Logic Pro 8’ manual. Although it’s still called the Arrange window, this window now provides a home for the majority of Logic’s functionality, consolidating editors, browsers, the mixer, and, of course, the traditional Arrange window into a single–window interface. 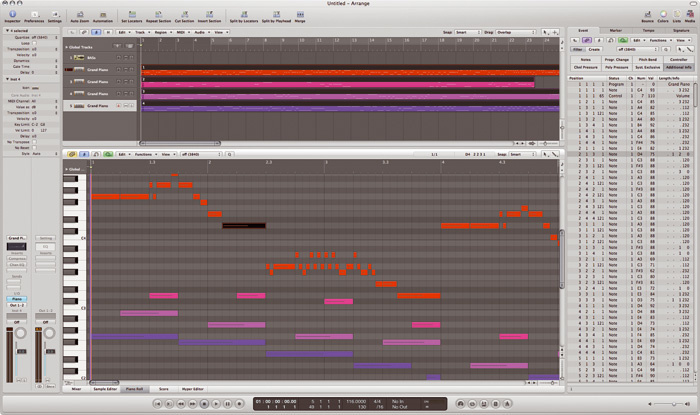 The main part of the Arrange window is still the Arrange area, and this provides the familiar functionality of Logic’s older Arrange window, using the same colour scheme as Logic 7. It looks much cleaner than in the previous version, though, and I wonder if this points to Apple now using Cocoa for Logic’s interface and making better use of Mac OS X’s Quartz graphics technologies. The Arrange area now incorporates all of the windowing features of the previous Arrange window, such as the additional sub–menus and Logic’s windowing buttons for Link mode, Catch, and so on. The ‘Up One Display Level’ button, which allows you to move up through a Song’s folder hierarchy, has been thoughtfully renamed to ‘Leave Folder’ and now has a more meaningful icon. The Arrange window now features a toolbar, providing easy access to some of Logic’s most common functions, and it can be hidden if you wish. Like the toolbars in Apple’s other applications, you can Control–click it to specify whether the toolbar commands are represented as icon and text, icon only or text only, and customise the commands that are shown. The Transport bar is now a permanent fixture at the bottom of the Arrange window. I think this is a good idea, since a floating transport window always ends up obscuring something else and you can never quite figure out where it should go. I’ve always used Logic’s ability to draw transport controls in the Arrange window for this reason, although they used to be located in the upper–left part of the window, above the Track list. I’m not sure I love the Transport bar at the bottom of the screen, although I find it amusing that this is exactly where Steinberg put their static transport bar in the early days of Cubase on the Atari in 1989. 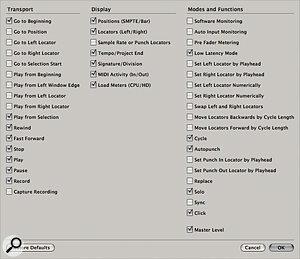 Logic allows full customisation of the Arrange window’s Transport bar, providing this sheet of options for the controls you can include.Again, you can customise what Transport controls are displayed by Control–clicking the Transport bar, and it’s still possible to open additional ‘floating’ transport windows if you wish, although you won’t be able to hide the Transport bar in the Arrange window any more. A nice touch in the Transport bar’s display is the ability to show either the bar or SMPTE time in a larger font, although every time I Control–clicked the display to choose another mode, after that mode was selected the smaller ‘Customise Transport Bar’ menu popped up on its own and needed another click to be dismissed. You can also still open ‘giant’ bar or SMPTE time displays in their own windows, which now appear in the black, slightly transparent style used by Apple’s other professional applications. Unfortunately, though, the time is now displayed in a dull grey colour, which is less visible from a distance than the old yellow or red. I couldn’t figure out a way to change the colour, but I hope this is something that will be possible to do in a future update. The Parameters section of the Arrange window remains where it’s always been, to the left of the Arrange area, but in Logic 8 is referred to as the Inspector. Although its appearance has changed to a lighter shade of grey to fit in with the style of the new single window, the functionality and layout remain largely unchanged. A particularly interesting addition is a second Channel Strip in the lower part of the Inspector, which is used to show the strip of a channel related to the selected track’s own Channel Strip. For example, with an audio–based track, by default the second strip will represent the output to which the selected track is routed. But if you adjust a send on the selected track, the second strip will switch to show the channel that represents the destination bus of the send. You can also switch what the second strip shows manually, by simply single–clicking either a bus or the output assignment on the selected track’s strip. This seemingly small addition to the Inspector is genial, and makes you wonder why no one else has thought of doing it before. The new Library browser makes it easy to choose different channel settings appropriate for the selected track. Here you can see an External MIDI track being assigned to a Rewire destination.Another new feature in the single–interface approach of the Arrange window is the ability to incorporate Logic’s list editors and a new set of media browsers to the right of the Arrange area. Although initially hidden, when you create a new audio track or Software Instrument track the New Tracks sheet has an option to ‘Open Library’ after the track has been created, which, if enabled (it is by default), opens the Library. You can also open the Library manually, by clicking on the appropriate icon in the right of the Toolbar. If you have an unassigned audio track or Software Instrument track selected, the Library shows suitable Channel Strip settings that can be applied to the selected track, which are organised in a column view hierarchy identical to the one used in the Finder. Selecting a setting automatically applies that setting to the selected track, making it incredibly easy and fast to try different settings without having to navigate a tree of pop–up menus. If you’ve already assigned a plug–in instrument to be used by a Software Instrument track, the Library will show the presets available for that particular instrument. This only works for Logic’s instruments at the moment, though, and you’ll need to remove an instrument plug–in from a Software Instrument track if you want to access the collection of Channel Strip settings in the Library again. If you have an External MIDI track selected and it’s assigned to a multi–instrument, the Library will show other assignments available on the same object, in addition to a list of ‘Other Objects’ that are available in the Environment. It seems a shame that there’s no way to incorporate the full patch list of a MIDI instrument into the Library, though, and assign a different patch to an instrument channel by clicking on the name as you can with software instruments. The External MIDI track behaviour is the first real clue that Logic’s Environment is alive and well and that the underlying MIDI system is still pretty much the same as in previous versions. It also means that there’s still no easy way to create new MIDI Instrument objects from the Arrange window. Something that is easier, though, is working with Rewire. If you have a Rewire slave application such as Reason loaded alongside Logic, an entry for the app will show up in the Library for an External MIDI track, and you can select a Rewire destination from a list of available destinations within that application. A big improvement! Getting back to the Library, perhaps the icing on the cake is a search field that allows you to enter keywords to find certain entries in the Library that are related to the selected track. This is great, and works with anything that can be displayed in the Library, such as channel settings, Presets, and even External MIDI assignments, making it quick and easy to find all of your ‘string’ patches that are suitable for a given track. The Library is just one of four Media Browsers that can be displayed to the right of the Arrange window. You can switch to different browsers that show the Audio Bin, Loop Browser or File Browser, using the tabs just below the toolbar. The Audio Bin is the new name (borrowed from video editing software) for the Audio window, which provides an overview of the audio files within a project. The Loop Browser is a redesigned Apple Loops browser, while the File Browser allows you to navigate your Mac’s filing system and drag in files without having to switch to the Finder and leave Logic. In addition to the Media Browsers, Logic’s list editors can also be displayed in this area. by clicking the Lists button on the toolbar, and there are four tabbed pages that allow access to the Event, Marker, Tempo and Signature editors. Having access to the Event editor within the Arrange window is very helpful, especially when you want to check start times or make minor numerical adjustments. Being able to see list editors for Marker, Tempo and Signature events directly in the Arrange window, alongside the graphical alternatives available via Logic’s Global tracks, is equally handy, particularly for film composers, who now have quick access to Logic’s tempo commands. 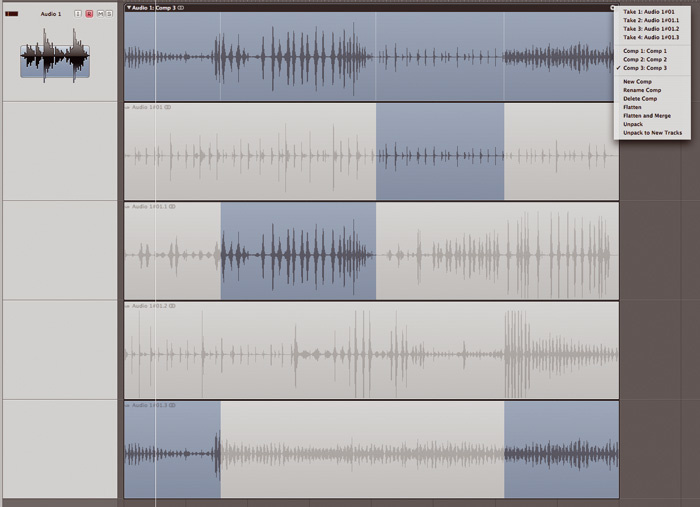 In addition to the list views that appear to the right of the Arrange window, this new window also incorporates split–screen editing for Logic’s more graphical editors, in the same way as Apple’s entry–level GarageBand software. Double–clicking a Region in the Arrange area splits the main space of the Arrange window into two sections, with the Arrange area remaining in the top part while an editor opens at the bottom. By default, this is the Piano Roll (nee Matrix) editor, but you can change this preference if you like. A divider between the two areas allows you to adjust which gets the most space, although it’s impossible to make the Arrange area disappear completely by dragging the divider all the way to the top, which might have been nice. The editor is closed by double–clicking the divider, or toggling the editor’s button at the bottom of the Arrange window, and you can also switch editors by selecting the button for a different editor. This approach is not dissimilar to the Consolidated Window introduced in Digital Performer 4.5, but in Logic the workflow seems cleaner and easier to work with. Because the Inspector can now take on a different role depending on what area has the editing focus, the familiar toolbox where you would select different editing tools has been removed. Instead, a new Tool menu in the top–right part of each editing area allows you to select different tools for that editing area, and, depending on how you have Logic configured, you will actually see either two or three tool menus to select the primary, Command–click, and secondary click tools. Unlike Logic 7, where the secondary mouse button was assigned to a tool by default, in Logic 8 the secondary mouse button opens up a new contextual menu instead. However, as before, it’s possible to configure the secondary mouse button to open up a toolbox (now displayed as a menu rather than the old–style toolbox) or assign it to a tool, which is when the third Tool menu will appear. You can still use the Escape key to open the new Tool menu, and the number keys can still be used to select a tool from that menu. Although I mentioned that the Inspector can take on different roles depending on which editor you’re working in, the Piano Roll editor no longer makes use of the Inspector at all. This means that there’s no way to see information for the selected events in this editor, although a field has been added to the Piano Roll editor’s toolbar to tell you how many events are selected, or how many regions are being displayed in the editor if no events are selected. The lack of information about the selected events is potentially annoying, particularly if you’re used to editing this information numerically; but in many ways Apple have actually provided a far better solution. Since the Event List editor can be incorporated into the Arrange window in a separate area to the Piano Roll editor, you can use this instead to see numerical data about which events are selected, assuming you have the Link modes set up correctly. Staying on the subject of the Piano Roll editor, I like the fact that its default behaviour is now to show the events from all regions selected in the Arrange window. Before, this could only be achieved with the correct Link mode settings and enabling of ‘Show Selected Regions Only’ (no longer needed or present in Logic 8), which was a bit of a pain. And a nice touch is that the Piano Roll editor now also shows the start point of regions with a coloured line at the appropriate location. However, I really wish the Piano Roll editor had received a little more attention. In particular, many users, including myself, were hoping for the ability to have multiple Hyper Draw lanes visible. On the plus side, key commands have been added to switch between different controllers for Hyper Draw, such as Volume, Pan, Velocity, and so on, although I’m surprised they didn’t create a command for Expression while they were at it. The mixer is also available in this split–screen view, and appears automatically if you double–click a track’s icon in the Track List. Some Logic users used to divide their screen in this way in previous versions, so I’m sure being able to incorporate the mixer directly into the Arrange window will be welcomed by many people. To make the mixer more useful as part of the Arrange window, Apple have implemented three different views: Single, Arrange and All. If the mixer is set to All, it will show every Channel Strip used in your project, grouped by Channel Strip types. However, if you set the view to Arrange, which is the default, the mixer will show all of the Channel Strips used by tracks in the Arrange area, in the order in which they appear, followed by any Auxiliary, Output and Master Strips in use. This is really useful, and an added bonus in this mode is that if you have Auxiliary Channel Strips that are assigned to be additional outputs from a multi–output software instrument, the Auxiliary Channel Strips will be automatically grouped with the Software Instrument Channel Strip that represents the parent instrument. Last, but not least, the Single view shows all the Channel Strips that relate to the signal flow of the selected track in the Arrange area. So if you have an audio track that has two sends to two Auxiliary channels, you’ll see five different strips in the mixer: one for the audio track, two for the Auxiliary channels you’re sending to, one for the output of that audio track, and one for the Master. These new mixer views really make life easier, and one particularly neat touch I came to appreciate was the way that Auxiliary Channel Strips automatically became visible as I assigned sends to a particular bus for the first time. Apple refer to this behaviour as ‘progressive disclosure’, which sounds like a term borrowed from a more adult–oriented industry, but describes Logic’s new ability to reveal features as they’re needed by the user. Not Used To Being Single? 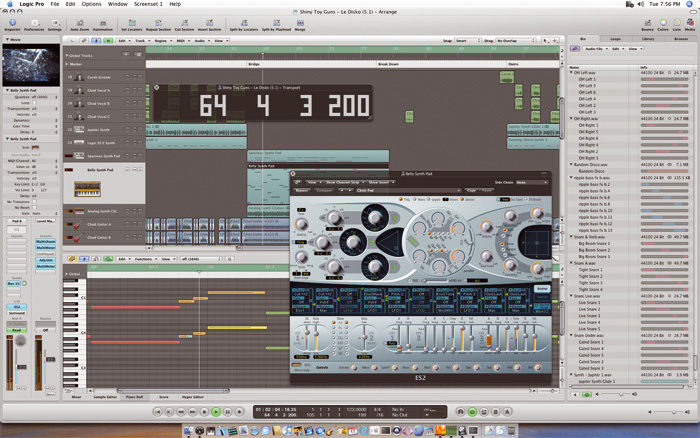 Although Logic 8 is obviously very much designed to allow most features to be accessed via the new single–window interface, existing Logic users will be relieved that you don’t have to work in a single window if this approach doesn’t suit your workflow, or if you want to open editors on additional displays. Logic’s Window menu is still in the menu bar and you can select a window from this menu (or by using the key commands) to open that particular editor or browser in its own independent window. However, I couldn’t find a way to open an editor in a new window just by double–clicking a region in the Arrange area; you now need to hold down the Option key as well, and I couldn’t find a way to modify this behaviour. Since you can still work with multiple windows, Logic’s Screensets feature is also still an integral part of the new experience, although you’ll need to tweak your Screensets from older Logic songs to make them look right in Logic 8. Screensets store the configuration of the single–window interface as well as arrangements of multiple windows, and some nice touches are the abilities to name Screensets and to select them from the Screensets menu, rather than just via the numeric keypad. However, even though it’s still possible to work with Logic using multiple windows, I have to say that the new single–window interface is a bit of a revelation. It looks and feels radically different, but you soon realise that the only thing that’s really been removed is the hassle, and having quick access to the list–based editors, browsers, and Channel Strips makes working in Logic significantly easier. One slight issue to be aware of is that some screen elements take up a bit more space than before, such as the new Inspector with its two Channel Strips. However, if I compare the dent in productivity that comes from losing a few pixels in the Arrange area with the increase in productivity because I don’t have to open and close a mixer window every time I want to adjust an Auxiliary channel, the advantage of the new interface becomes clear. Although Logic 8 starts to make even a 1920 x 1200 display look a bit small, the real estate required is more than compensated for by the increase in productivity. The single-window interface makes it easy to combine multiple editors into your workflow. Here you can see the Event List showing the selected note in the Piano Roll editor, which is itself showing the selected regions from the Arrange area.Although there are many other examples of single–window interfaces in audio and video applications, Logic’s implementation is one of the best: it’s clearly laid out and very hard to screw up. If you compare it to Soundtrack Pro’s interface, for example, which has the same basic layout, Soundtrack Pro allows you to tear away tabs to make floating windows. And if you close one of these floating windows by accident, it just disappears without automatically reappearing where it was originally torn away from. To put the tab back you have to open the floating window again and drag the tab back to its original location. While this customisable approach is useful in some situations, it’s also confusing, and with Logic 8 I think Apple have got the design and functionality of the single–window interface absolutely spot on. In addition to the user–interface enhancements, a number of new audio editing features and improvements have been added to the Arrange area in Logic 8, including the long–overdue ability to carry out sample–accurate edits to regions and automation data. And to make it easier to see the waveform of quieter signals when you’re fully zoomed in on an audio region, you can increase the display amplitude with the new Waveform Zoom function. Clicking the Waveform Zoom button enables this mode, and clicking and holding brings up a slider to adjust the display amplitude. What’s nice is that you can then toggle the Waveform Zoom button between the normal display amplitude and the zoom setting. There’s also some handy ‘snap to transient’ key commands for making range adjustments to a selection made with the Marquee tool. This means that if you want to select a certain piece of audio, such as a drum hit, you can now make a rough selection and use key commands to move the start or end points of the selection to the nearest transient. Quick Swipe provides a graphically intuitive way of comping multiple takes of a region. 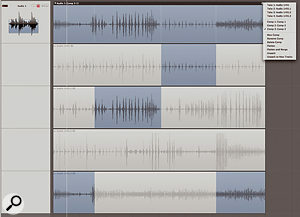 Notice the Take Folder menu in the upper right corner that allows you to choose between takes and comps, in addition to performing other operations to help you build the perfect take.The biggest new development in terms of editing audio in the Arrange area is the new comping feature, which Apple refer to as Quick Swipe. When you record multiple takes over the same range of your project using Cycle Record, Logic will now build a Take Folder that contains all of the takes you recorded within one region. The Take Folder region will be displayed with a small down–arrow–in–a–circle icon in the top right, and clicking this icon presents the Take Folder menu, where you choose which take that region will play back. If you’ve seen GarageBand 08, this will sound quite familiar, as GarageBand also incorporates this functionality, although Logic does take it one stage further. Being able to select different takes is all well and good, but most of the time you’ll want to comp a master take out of the many takes you recorded. To do this, you can now simply double–click on the Take Folder, and all the takes will be displayed underneath the master take, with the current take displayed with the region’s colour and all the other unused takes shown in grey. You can click on different takes to select one as the master take, but the cool thing is that you can also click and drag out a region of an unused take to use this part of the take in the master. The parts of each take that are used in the master take are always shown in the region’s colour, and everything else remains greyed out. Once you’ve made a few edits, a nice feature is that you can try out alternate versions of the same edit in another take by simply single–clicking in the unused part of that take. And edits can be adjusted after you’ve made them by simply dragging their edges; this is where the new sample accuracy can come in really handy, especially since Logic automatically updates the display of the master take to reflect the edits. If you’re happy with a comp but want to try a different approach, you can select New Comp from the Take Folder menu to create a new comp, using the existing comp as a starting point for it. This is a pretty powerful facility, since it makes it easy to switch between complete takes as well as different comps, and once you’re happy with your comp or chosen take, you can simply double–click the master region to close the Take Folder again. One slight niggle I have with Quick Swipe is that you can’t adjust the crossfades manually when editing together a comp. Logic provides a preference for the time and depth of the crossfade curve, but this is an application–level preference and can’t even be set independently for each song. However, you can unpack a Take Folder onto separate Tracks if you wish, and, as with GarageBand, if you chop up a Take Folder region, you can still access the Take Folder menu for each of those regions and select different takes or even create comps. So in a way you end up with the best of both worlds. Another limitation of Quick Swipe is that it really is a region–based editing tool, in that you can’t have edits apply to multiple regions simultaneously. This means that if you make a multitrack recording of an instrument, you’ll have to edit each Take Folder region separately, unless you stick to Logic’s more conventional audio editing tools. You can also work with multiple takes of a MIDI region in a similar way, although you’ll need to change the ‘overlapping recordings’ setting from ‘merge only in Cycle record’ to ‘create Take Folders’ for this to work. And although multiple MIDI takes do end up in a Take Folder, Logic only lets you choose a master take — you won’t be able to comp a perfect take using the Quick Swipe technique. This is a shame, since I think Quick Swipe in its current form would almost be more useful on MIDI regions, where you wouldn’t have to worry about crossfades, for example. One area of Logic 7 where the application was really beginning to show its age was the mixer. 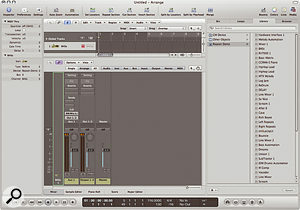 Other than the introduction of automation in version 5, Logic’s mixer has remained largely unchanged since the days of version 4, and has slowly been falling behind the competition with its dismal surround implementation and the lack of flexible bussing to handle situations where, for example, you might want to use a bus as input to an audio track for internal recording. Fortunately, Logic 8 addresses many of these issues with significant improvements to the mixer, including the ability to use buses as inputs to audio tracks and Auxiliary channels. Perhaps the biggest architectural change to Logic’s audio abilities is the new support for surround across all elements of the mixer. Audio tracks can now be true surround tracks, rather than just being mono or stereo signals routed to a surround output, and you can actually record onto an audio track with a surround input as well. Buses and Auxiliary channels can be surround, and Logic’s handling of plug–ins has also changed to accommodate surround usage. Whereas deciding the output configuration of a plug–in used to be the first decision you made when selecting a plug–in to use in Logic 7, it’s now the final decision you make when selecting a plug–in in Logic 8. This actually makes a good deal more sense, since your first thought when adding a plug–in is going to be what plug–in you want to add, not worrying about the output configuration. Once you find the plug–in you want to add in the pop–up menu hierarchy, a sub–menu appears for each plug–in, offering the available output configurations, although you can release the mouse on the previous menu level with just the name of the plug–in highlighted and have Logic choose the most suitable configuration for you, if more than one is available. Logic now offers support for surround plug-ins and includes many useful surround effects and analysis tools. 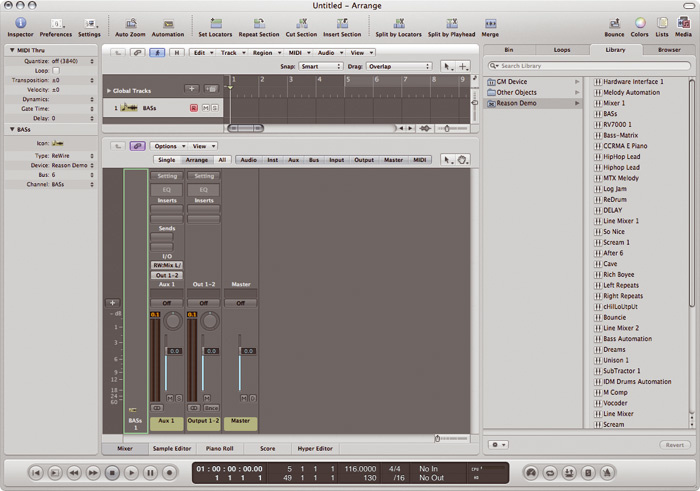 However, as you can see from the Preferences window, the mixer still only supports a single surround output.Although there are many true–surround plug–ins supplied with Logic 8, such as the new Delay Designer (of which more next month), an updated Space Designer reverb with support for surround impulses, Surround Compressor, Multimeter, Level Meter and Multichannel Gain, other plug–ins can be used in surround via a new multi–mono configuration. This is quite similar to Pro Tools’ multi–mono handling of plug–ins, and Logic adds an additional page where you can assign the individual mono channels to one of three link groups, or make them independently controllable. A really neat addition to Logic’s audio arsenal, which is especially helpful for those working in surround, is the ability for Logic to burn either an audio CD or uncompressed DVD–A of the current project via the Bounce function. This is really helpful when you need to create a quick CD or DVD–A containing only your current mix, and saves the hassle of dealing with additional software, which makes life significantly easier for making a DVD–A with a surround mix. 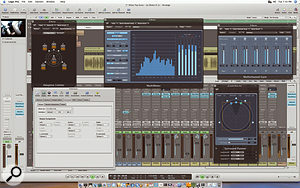 Logic Studio still includes Waveburner for creating CD audio masters, and although it’s a shame this program hasn’t been upgraded with DVD–A authoring features as well, Logic Studio also offers Final Cut Studio’s Compressor application for encoding your bounces into Dolby Digital AC3 format. This is a pretty nice addition if you consider that Steinberg charge an extra $999 for the Nuendo Dolby Digital Encoder. These new surround features are great, but I do feel there are still some big limitations when compared to Cubase or Pro Tools (although Pro Tools LE doesn’t actually support surround, of course, and HD is vastly more expensive than Logic). Firstly, you still only get one surround output, and there’s only one surround input available as well, both of which have to be configured globally rather than being specific to each project. This might not be a big limitation in music production, where you might only need one surround output if you do everything in Logic (which is surely Apple’s hope and intention), but I think this is potentially limiting for those who route audio outside of Logic to mix in a different system, which is quite common amongst film composers with larger studios. Having one surround input and output pair is also limiting because it means you can only have one surround configuration in a song, meaning you can’t easily juggle, say, quad and 5.1 channels in the same project. And while I’m moaning, it’s also a shame that you can’t access the individual mono channels on a surround bus. Aside from surround, Logic 8’s audio engine isn’t so different from that of Logic 7. There are some small but welcome improvements, such as audio tracks now having input monitor buttons, and the fact that you don’t have to ‘relaunch’ the audio engine every time you change drivers or adjust the buffer size. Actually, that latter change is really welcome. But in terms of sound and performance, the audio engine sounds the same (see the ‘Differential Mixing’ box) and pretty much performs the same as well, so long as your computer can handle the more complex user interface without breaking into a sweat. The fact that Logic’s performance is more or less unchanged on a modern system is a mixed blessing, because I was really hoping that Logic 8’s audio engine would finally be able to take proper advantage of multiple processing cores. When I reviewed the Mac Pro back in December 2006’s issue, Logic 7.2.3 was capable of running 210 simultaneous PlatinumVerb instances on it, with 222 percent Logic usage and 56 percent User usage. Running the same test with Logic 8 on the same four–core 3GHz Mac Pro gave a small improvement, but showed approximately the same amount of processor usage. This time I ran 225 instances with 220 percent Logic usage and 56 percent User. Although the CPU performance shows Logic taking advantage of all the cores, there are clearly some issues that need to be addressed. Leopard promises better scheduling for multicore Macs, but I don’t think this is where the problem is, since it’s already possible to get closer to 95 percent User usage when running Cubase on the same machine. In terms of the user interface, this version is arguably the most significant upgrade in Logic’s 15–year history, and Apple have done a tremendous job of making the program easier to use and more approachable for new users. For existing users, this translates into a much quicker workflow, and once you realise that, despite the initial cosmetic differences, Logic 8 is still largely the same Logic underneath, working in the new version becomes completely intuitive. Most of the new features in Logic Pro 8 (and Logic Express, which we’ll be looking at in a future Apple Notes) are geared more towards music production than music creation. Logic already had great music creation features, of course, and arguably it was important for it to catch up a little on the audio side, especially in terms of surround and sample–accurate editing in the Arrange area. It will be interesting to see if Apple turn their focus back towards music creation features in the next version, as, for example, Cakewalk seem to be doing with Sonar 7. I was a bit surprised that there weren’t more ‘under the bonnet’ changes in Logic 8. I mentioned the continuing inability to take full advantage of more than two processing cores, but it would also have been nice to finally have true millisecond delays for MIDI objects, rather than a tick setting displayed in milliseconds that changes according to the tempo of the song. I was also surprised that the EXS24 sampler didn’t receive more attention. While Apple did provide a new editor and changed the way EXS24 addresses memory, no major functionality was added to the actual sampler. Although EXS24 is great, it hasn’t changed since 2002 — although, to be honest, I would have settled for just the ability to use more than 64 stereo voices per instance. Ultimately, though, Logic Pro 8 is a great release. There are a few anomalies lurking in the application, but on the whole it’s incredibly stable and has only crashed on me once so far — and that was when I was overloading the EXS24 with more samples than the computer had memory for. The new user interface makes Logic more enjoyable and quicker to use than most existing users would have thought possible, and when its improvements are combined with the dramatic new pricing and the lack of copy protection, Logic Pro 8 and Logic Studio set a new standard to beat. In order to use Logic Studio, you’ll need at least a 1.25GHz G4 processor, although a G5 or Intel processor is recommended, and required if you want to work in surround. A minimum of 1GB memory (2GB or more is preferred, especially for loading larger EXS24 instruments) is also required, and you’ll need Mac OS 10.4.9 or later and QuickTime 7.2 or later. Many users have said that songs they had originally created in Logic 7 sound different (and ‘better’) in the new version, so I was interested to see if this was indeed the case. I chose a song for the test that many people will know and love — the classic Logic 6 demo song — and bounced down a stereo version (24–bit, 44.1kHz, with no dithering) in both Logic 7 and Logic 8. After inverting the phase on one of the mixes, I played it against the other to see if it would cancel out. Curiously, the very beginning of the song did indeed cancel, but as more tracks came in, it was clear that the two versions were quite different. Initially, I wondered about pan law differences. Prior to version 7, Logic’s mixer used a fixed 0dB pan law, meaning that as you pan left, the left channel will remain at 0dB while the gain of the right channel is decreased, and vice versa. This makes signals panned in the centre slightly louder than those panned hard left or right, which can sound a little unnatural. However, since Logic 7 you can choose from three different pan laws: 0dB, –3dB (where the signal will be attenuated by 3dB when panned centre), and –3dB Compensated, which keeps the signal at 0dB in the center, but increases it by 3dB when panned hard left or right. In Logic 7, 0dB was still the default pan law, but in Logic 8 the default is now –3dB Compensated. However, if you import a song created in version 6 or earlier, Logic 8 sensibly resets the pan law to 0dB, so that wasn’t it. At this point I decided to take a step back and try something more basic. Taking some reference high– and low–frequency noise files from M&K’s web site (www.mkprofessional.com/wav/index.htm), I put the high–frequency audio on one audio track and the low–frequency audio on another and bounced the result. The two bounces phase–cancelled, making the case that Logic 8’s mixer was producing different–sounding results somewhat unlikely. Just to be sure about the panning, I made a second set of bounces with one track panned halfway left and the other panned halfway right, and these also phase–cancelled perfectly. Going back to the Logic 6 demo song, the first part of the song features audio with no plug–ins, which phase–cancelled just fine, and the differences seemed to start when the third track came in, which was using Logic’s built–in Channel EQ plug–in. I went back to the high–frequency noise audio and bounced it using the Channel EQ plug–in in both Logic 7 and 8. This time, the noise didn’t cancel itself out, meaning that the Channel EQ plug–in was indeed behaving differently with the same settings in the two different versions of Logic. I repeated the test with a basic Audio Units plug–in instead, to make sure the difference wasn’t caused somewhere between the signal being passed to or from a process in Logic 8, and sure enough, there was perfect cancellation. Finally, I bounced the Logic 6 demo song again, but this time without any Channel EQ instances, and this time the mixes of the song created in Logic 7 and 8 did indeed phase–cancel correctly. Well, almost. There were actually two regions of audio on one track that refused to cancel, which was rather odd, since other regions on the same track would cancel, and there weren’t even any effects on that track! It turns out that when Logic 8 converts the start time of a region from a Logic 7 song, the region doesn’t always end up in its original sample position, presumably due to the new sample–accurate behaviour in the Arrange area. This behaviour seems to mostly affect regions that don’t start on a whole beat position. The basic point of all these tests is that the mixer sounds identical in Logic 8 when compared to previous versions, and that the differences people are noticing are due to changes in the Channel EQ and other widely used plug–ins, along with the fact that the default pan law for a new project is different. I don’t mind the EQ being made to sound better, which it absolutely does, but the ability to enable a compatibility mode, so that mixes created in the previous version of Logic could sound the same, would have been useful. When Apple released Soundtrack Pro 2 a couple of months ago, it featured redesigned GUIs for the included former Emagic effects, and there was much speculation that the same designs would be used in the next version of Logic. This is indeed the case, and all Logic’s built–in effects that previously used the bright blue user interface introduced with Logic 4 now have a more subdued appearance that better suits the look of Logic 8’s user interface. The window in which plug–ins appear has also been redesigned, with more functionality in the window’s toolbar. There’s a Pro Tools–style Compare button, which allows you to change a plug–in’s parameter and then switch between the before and after settings to audibly compare the difference. The pop–up menus that allow you to switch between different plug–ins now have more meaningful titles, and buttons for the next and previous settings commands, along with the copy and paste commands, have been added to save you having to navigate the preset menu to access these functions. The lower part of the plug–ins window has also been extended downwards, beyond the plug–in’s user interface, and displays the plug–in’s name in big bold letters. Some of Logic’s plug–ins also have some extended controls that can be displayed here, which justifies the extra space, but I do wonder why Audio Units have the same black bar underneath the plug–in’s interface. Since most plug–ins often incorporate the name of the effect or instrument into the design of the interface, I wonder why Logic has to add its own naming bar in way that takes up more pixels than is necessary. A slightly more serious issue is that, for the most part, Logic 8 won’t let you access multi–output versions of Audio Units plug–ins that have multiple outputs. Logic itself is still compatible with multi–output Audio Units, but the application has become stricter in how it distinguishes whether an Audio Unit has multiple outputs or whether it has a surround output (or both). For this reason, most Audio Units plug–ins need to be tweaked for multiple–output versions to be used in Logic 8, although Logic 7 songs that use Audio Units plug–ins with multiple outputs will work perfectly in Logic 8, keeping the multiple outputs intact. The reason this works is that, since Logic 7 didn’t support surround outputs from Audio Units plug–ins, Logic 8 knows that if it’s loading a Logic 7 song it can assume that any questionable Audio Units plug–ins are indeed multiple–output instances rather than having multi–channel outputs. On the plus side, as I finish this review most third–party companies are already releasing minor updates, and I was able to try Spectrasonic’s 1.6.1 Stylus RMX update, where the multiple–output functionality worked fine with Logic 8. If you have a studio Mac and a laptop, the new ability to share Logic 8 Settings over the Internet or a local network will be very welcome. The Bonjour network sharing is very slick indeed. Channel and Plug-in Settings show up in the Library (Key Commands show up in the Options/Presets sub-menu), and when you create new Settings, they automatically become listed on other Macs sharing your settings. The .Mac sharing is equally useful, but sometimes needs a nudge to update Settings. 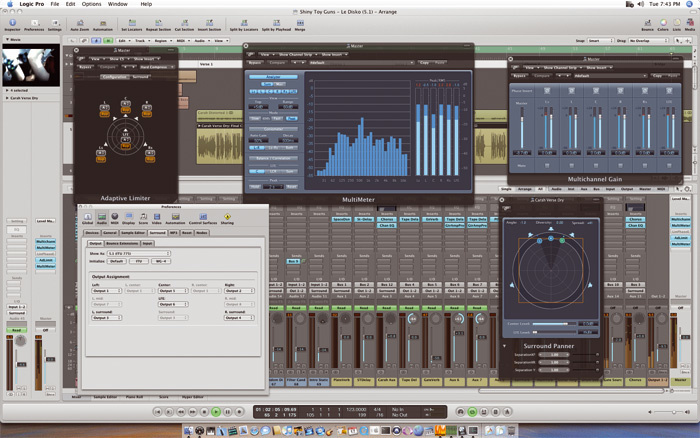 Logic Pro 7 introduced Logic Node, which distributed audio processing tasks over a network. This was a powerful idea, but its implementation was disappointingly limited: you could only offload Logic’s own effects and instruments, and even then, Ultrabeat and EXS24 were excluded. In Logic 8, in theory, Audio Units effects installed on both machines can be offloaded as well, but in practice, I couldn’t get this to work. Logic Pro 8 seems not to be a 64-bit application, though we won’t know for sure until Leopard (Mac OS 10.5) is here, but the EXS24 sampler can now address more memory, so you can now load considerably more instruments than in Logic Pro 7, assuming your Mac has more than 4GB of RAM. However, the extended memory is only available for pre-loading samples that are streamed from disk, so you won’t necessarily be able to play back more voices of polyphony if your disks can’t keep up with the fact that there are now more instruments loaded. We’ll look at this feature more closely in a future Apple Notes. Originally introduced with Final Cut Studio 2 earlier in the year, this latest version of Soundtrack Pro is aimed at those who need to edit or create a soundtrack for a media project. A brand–new application that integrates Logic’s mixer, effects and instruments with an intuitive new customisable interface for those who want access to Logic’s sound when playing on stage. Emagic’s classic CD audio authoring software is still alive and provides all the features you need to master an audio CD of your mixes. Another tool from Final Cut Studio, Compressor enables you to encode your music in Dolby Digital AC3 format. A new utility for creating your own impulse responses for use with Space Designer. This is a really neat tool and effort has been made to provide an easy–to–use interface, along with a full electronic manual explaining what to do. Allows you to tag your own audio loops in Apple Loops format for use in supported applications. Look out for full reviews of Soundtrack Pro 2 and Main Stage in next month’s Sound On Sound. Logic 8 installation went pretty painlessly for me, though the newly installed version insisted on re-checking all installed AU plug–ins, which can take some time. As is often the case, some of these failed first time around but were passed when the AU validation process was persuaded to take another look at them. A nice improvement is that Logic no longer has to close down while the AU validation process is running, and when you do open Logic from cold, it seems to fire up rather quicker than before. In my view, the GUI redesign is no bad thing, though the slightly bland colouring, combined with acres of grey background, can make the screen look somewhat unexciting, and some of the text is actually harder to read than previously because of reduced contrast with the background. Plug–in setting menus also come up white on black, which I find really hard on the eyes compared with the more usual black on white. On the whole, though, I like the new look, and having more things accessible via tabs rather than having to search in menus really speeds things up. I also really like the new panel of pictorial track icons as they now cover just about all instrument types. Those two Channel Strips really improve workflow, although the ability to turn off the second one would enable laptop users to make better use of their screen space. The new–look plug–ins appear a bit clinical, but new features, such as the choice of gain–reduction types and the switchable limiter in the compressor, make them even more versatile. New fast edit controls in ES2 are also very useful for quick and dirty editing, while Delay Designer looks to have a lot of creative potential. I like the new content browser, which can be opened in the right–hand side of the Arrange window, though for consistency, why don’t your external MIDI synth patches saved in Environment multi–instruments show up here too? A facility for importing instrument names directly from hardware would be better still. All those tool icons that you can add to the toolbar are welcome as they again speed up workflow, but existing users need to be aware that a few of the existing ways of doing things have been simplified, and now you often need to Control–click to bring up a menu, instead of scrolling the mouse over some none–too–evident portion of the screen. For example, MIDI tracks are now reassigned by Control–clicking over the Instrument name in the Arrange window. The Audio main menu has also gone, so if you want to find the Hardware and Drivers pane, you need to look in the audio preferences under Core Audio. I spent ages trying to figure out how to open the CPU monitor window; it turns out you click in the transport window, which is actually a lot easier that searching for it in a menu. Iit is now much easier to create channels and tracks without having to venture into the Environment, and better still, actions such as configuring sends across multiple selected channels can also be carried out directly from the mixer window. I’d hoped the Arpeggiator might make an appearance outside the Environment, but then we have to leave something for the updates! There have also been some bug fixes that haven’t been documented. For example, with Logic 7 the I/O plug–in refused to work for adding a digital connection to an external processor in the master output, so you had to insert it into a bus instead, but now it works exactly as it should. There are also fixes for things that were more frustrations than bugs in earlier versions. For example, if you aborted a bounce, you used to have to fill in the file name and destination boxes again but now the previous ones are retained. At the same time, there are still some user requests that haven’t been implemented. There’s no Trim (offset) mode for mix automation, and although the new compiling feature is brilliant, there’s still no direct way to flatten or bounce–in–place a standard audio or Instrument track, which could have speeded up workflow when archiving projects as audio for transfer to another platform. The maximum number of named MIDI patch banks hasn’t been increased, so I still have two banks of sounds on my heavily expanded Roland JV2080 that can’t be accessed by patch name. For long–time Logic users, the new version is a bit of a mixed bag. Some functions and features have been renamed in line with Apple’s other Pro applications, which could cause some initial confusion, and some key commands have been reassigned. Sample–accurate editing directly in the Arrange page is a welcome addition, but I was surprised that you couldn’t edit MIDI data in the same way, as Apple seem to be moving towards the ‘everything in one window’ approach of their other applications. It was nice to see that Screensets have been retained, but annoying that you have to go in and manually allocate their old numeric key numbers. Several little useful features have been removed or hidden: for example, it’s no longer possible to change the audio playback channel for the Sample editor to anything but 1. The welcome new take management and Comping functions are limited by the fact that you can’t nudge the individual takes directly on the comp track, but the new key command to add four automation nodes to the region boundaries will make my vocal volume automation much easier. It’s a pity that Strip Silence still has a fixed zoom setting and only works on single tracks, as this would make all the difference when editing grouped tracks such as drums. The new Junction tool, which allows you to slide the boundaries of two adjacent Regions simultaneously, is a Godsend, and the ability to use AU effects plug–ins over nodes should keep my ageing Mac useful for a while longer. On my relatively new Core 2 Duo Macbook Pro, Logic 8 worked flawlessly with both Logic’s plug–ins and the Focusrite Liquid Mix. However, on my old dual 1.8 G5 with 4MB RAM, the CPU hit was higher than version 7 — though I suspect that third–party plug–ins were to blame, as a project that just used Logic’s own plug–ins seemed to have almost identical CPU requirements. A more serious problem is that some plug–in presets and samples seem to be missing from version 8 and some settings have also changed, which meant that most of the Songs brought in from Logic 7 needed quite a bit of work to produce an acceptable mix. Space Designer seemed to be the worst culprit, with small tight reverbs inexplicably transforming themselves into huge boomy rooms! Ultrabeat, Logic’s drum plug–in, has received a major and useful update, with the ability to load EXS samples expanding the software’s sound palette in one go. You can now modulate the plug–in via a side–chain and the simple step editor has mutated into an excellent full–page drum sequencer. As the patterns from Ultrabeat can be dragged into Logic as MIDI Regions, it goes some way to becoming a proper drum editor like the one found in Cubase. 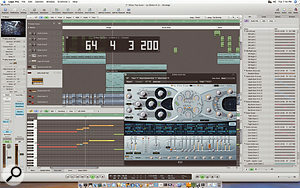 Intuitive single–window interface makes Logic easier and faster to use. Improved mixer and audio engine, with better surround support and the ability to record busses internally. Many long–standing issues have been addressed, such as sample–accurate region editing. Many long–standing issues still haven’t been addressed, such as the tick-based MIDI delays and the lack of full support for Macs with more than two processing cores. MIDI functionality has stayed much the same, with no improved editing for composing music. Surround functionality has improved, but is still lagging behind some of the competition. Logic Pro 8 is a significant achievement. It makes advanced music production tools accessible, both in terms of features and price, without alienating existing users. Logic Studio bundle £319; upgrade from previous versions £129. Logic Express £129 (upgrade £65). Prices include VAT.